This tutorial explains how to take full webpage screenshot from command line. CutyCapt is a free software that lets you capture full webpage screenshot using command prompt window. Normally, other standalone screenshot capture utilities can capture only visible part of a webpage/desktop screenshot. Therefore, those utilities can’t fulfill the need to capture complete webpage from top to bottom. CutyCapt comes in handy for such kind of situations. You can also set height and width for capturing the webpage screenshot. Apart from this, it lets you set output format as: PDF, jpg, png, svg, etc. How To Take Full Webpage Screenshot With CutyCapt? Step 1: Open Command Prompt window. Step 2: Drag n drop the extracted application file named as CutyCapt.exe to command prompt window. After this, press Enter key. It will explore all the commands that can be used with this software. As soon as command is executed, it will process the command. After a short delay, screenshot will be saved to destination location. 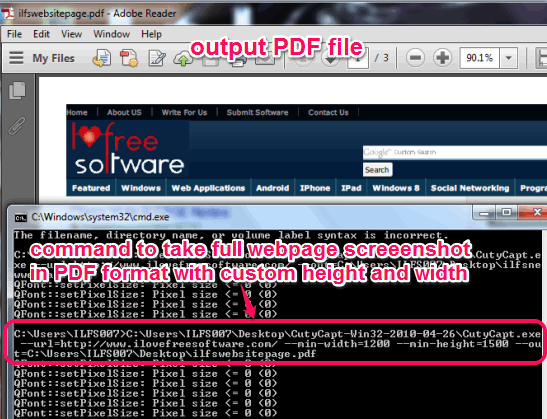 CutyCapt also provides a command using which you can capture full webpage with custom height and width. Command should be like this: “CutyCapt.exe – -url=webpage URL – -min-width=enter width – -min-height=enter height – -out=destination location+filename with extension“. There are multiple other commands available to use with CutyCapt. such as: enter delay time for capture, set maximum wait time for screenshot capture etc. You can use other commands according to your requirement. Above mentioned commands are the most important commands to capture full webpage screenshot. CutyCapt comes in handy whenever you have to capture full screenshot. Even if you are not well aware with command prompt window usage, you could take full webpage screenshot, as very simple commands are needed to be executed.